THE BRITISH RAILWAY STORIES LTD: "Codename: Industrial Saddletank"
It started, as all grand ideas do, over a beer in a pub. I am currently working on a venture with a friend, and our discussion which started over said beer, whilst on a trip to York, is starting to come together with very serious discussion and much thought on the way in which we proceed from this point on. I have become increasingly fed up of plastic kits, designed for railway modeling, which look easy enough for the beginner to the hobby, but ultimately end up proving rather poor in practice. Therefore, our first thought turned to a simple bodyshell kit, which could simply replace that on a "ready to run" chassis, most likely the "Railroad" small tank engines, that could be simply plonked on, and painted, to the delight of its young owner. I firmly believe the future of this hobby, in modeling, lies in allowing the youngest members the ability to try their hand at things like painting, and putting together kits, and if they are introduced to plastic kits which break, warp, or are otherwise difficult for the average modeler to put together, they will be turned off the hobby altogether. Sean and I thrashed out a business plan of sorts (which is always being revised to reflect our observations on the various forums, and magazines we read), and we have reached the stage where we are - separately, for the time being - designing and producing a "proof of concept" bodyshell to see if our theory can bear some fruit. Sean is developing a traditional outline Saddletank, to fit on one particular chassis, and I am developing a more quirky model to fit onto another chassis. So, we went for a change in medium, that you will have seen on these pages before. 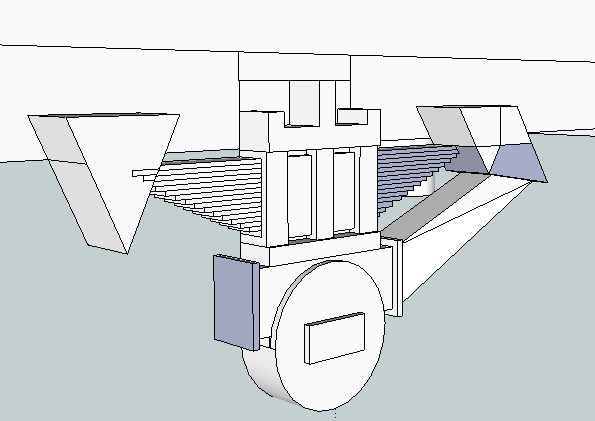 3D modeling, using Google Sketchup, a surprisingly powerful program considering it's completely free (the full package does have a cost to it, but for the purposes of this proof of concept test, this will do for now). 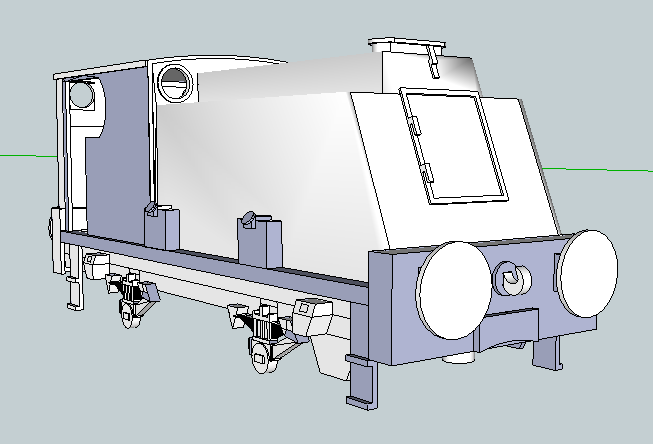 The idea is simple - a "Ready to Plonk" bodyshell to put onto a "ready to run" that will offer some customization for younger modelers, wanting to add something different to their growing collection of model trains. The chosen test subject to start me out in 3D modelling was a Vertical Boiler Tank (VBT) engine, Musketeer: a Sentinel steam locomotive. The bodyshell has been designed in this "proof of concept" to fit a ready to run chassis - the standard Hornby 0-4-0 (on which the Holden bodyshell usually resides). The reason for choosing this one was simple - it is readily available, and everyone and their mother has had one at some stage of their early modeling career. Not only that - I had one to hand to measure up! So, bearing the above in mind: a disclaimer. The illustrated 3D model was in no way 100% accurate. In order to fit the Hornby 0-4-0 chassis, the proportions of the prototype have been stretched in several areas - length of running plate and height of bonnet most noticeably. I had however tried to keep to the measurements in everything else, including the leaf springs/oil pots/bufferbeams/and so on. This was also my first 3D model - ever! So mistakes are likely and not unexpected. However, accuracy was not the point of this model - it was to see if the idea had merit, and could be taken beyond the 3D design stage. 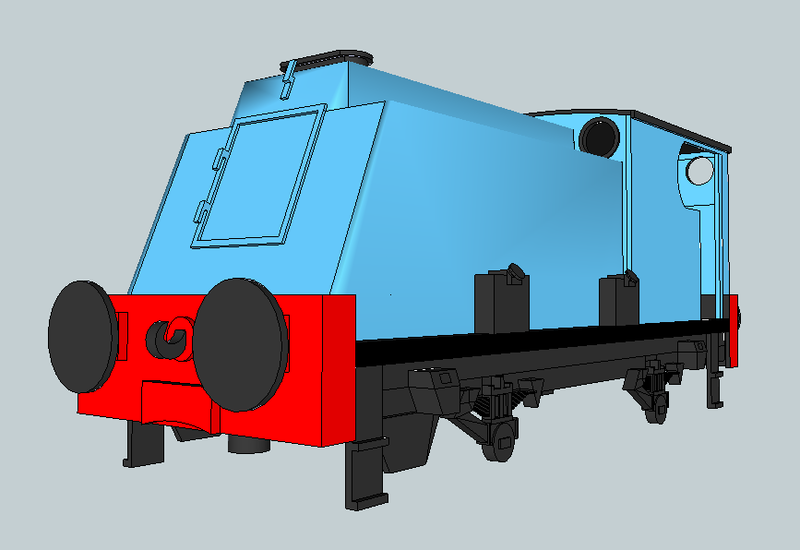 It has been measured and designed to fit exactly onto the Hornby chassis. At this stage, I saved the running plate as a separate item - it could in theory be reused for other projects as a template for how it all fits together on that particular chassis. The leaf springs - extremely crude I might add, as this is my first venture - are at least, in overall size and proportions, close to the real thing. However, the best way to learn is to try, and with the attempt at the Sentinel, I feel I have experienced a great deal of problems along the way that I have, for the most part, overcome. The next job was to add the cab - whose proportions are correct in height and width, but not in length, due to the fitting of this bodyshell to the chosen chassis. After this, it was a case of creating the "bonnet" to fit on top of the running plate. This is where the model really suffers - to clear the motor, the bonnet had to be made taller, thus changing the proportions of the cab to bonnet quite significantly. In retrospect, by raising the cab roof a little more, the overall look would have been better (but significantly out of scale in height). Colouring the model (as below) shows up the proportions compared to the real thing even more. However, accuracy was not the fundamental point of this 3D model. It was to prove that a bodyshell can be designed and manufactured, at a reasonable cost, to offer younger modelers a way in which to customize their models, and learn how to paint, at a very basic level. In some respects this proved a model could be designed to fit on a chassis, however in order to test the theory further, we had to change tactics a little. The next stage would be to create a simple kit, to be put together with plastic cement or similar, that would give a decent success in building up the confidence of a young modeller. This as an exercise into how to 3D model for the first time, had opened my eyes to what can be done, and the limits of the exercise. The next stage was choosing the prototype to follow through with a prototype bodyshell, and following the same stages as outlined here in the development of the VBT Sentinel. We decided after some basic market research, that our attention should be turned into producing a pair of shunting engines: one steam, and one diesel, as our first kits for young modellers. The bodyshells would be designed to fit onto an existing ready-to-run chassis, in order to provide a way of customizing a model and also allowing exploration of building, painting and finishing a locomotive for a model railway. The Sentinel appealed to me greatly as it looks very different, unusual and very unique - the light blue paintwork I picked (taken from my photographs of Musketeer, the locomotive we based the original mesh on) was striking and gave the mesh a certain appeal. In this respect, if we were trying to produce an all singing, all dancing, ready-to-run locomotive then I'd be looking over the plans for the little geared engine much more closely. I can fully understand why Model Rail picked a Sentinel themselves - the locomotives have a certain "Je ne sais quoi" about them. Sean and I spent several months discussing the choice, and throwing ideas into the mixing pot and thinking it through. We looked at what was available, and what wasn't, and what sort of chassis would be most likely to suit a bodyshell kit for a beginner to the hobby. We ended up back at the standard Hornby 0-4-0s quite often, and finally made a decision to get some drawings of a particular type of locomotive, and take a few photographs in order to develop a first new mesh. However, we wanted to make sure we had plans for the future, and the above picture shows this forward thinking to a degree. A great deal of care and attention to get it to this stage, though it looks simplistic in the extreme, and very plain. This is what I have termed the "template". This template has been designed to fit the standard Hornby 0-4-0 chassis (with cylinders). It is basic enough so that - if we deem it necessary - we can sculpt a variety of different styles of steam locomotive on top, thus increasing the scope of the range, whilst also offering variety in our products. The above picture shows my initial (rough) render of our proposed steam engine bodyshell kit. 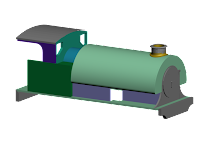 It is a simple industrial shunter, based on a Hawthorn Leslie 0-4-0ST. It's not one hundred per cent accurate to prototype, as it has been designed to fit onto the Hornby 0-4-0 chassis (and therefore there is a little stretching in the proportions, although not as much as I had initially feared). It is based on a few scale drawings, and several hundred photographs I found of the Hawthorn Leslie locomotive in question! 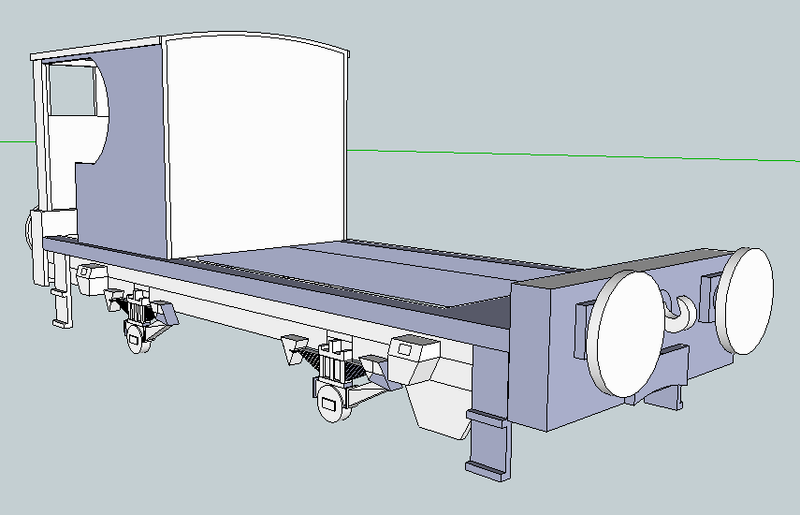 The way Sean and I have decided on developing the meshes is as thus: I design and create a basic bodyshell, minus details, that will fit onto a specific chassis, rendered in Google Sketchup. Once satisfied with the overall dimensions and proportions, I send the mesh onto Sean who uses it as a further template for one with better detail. 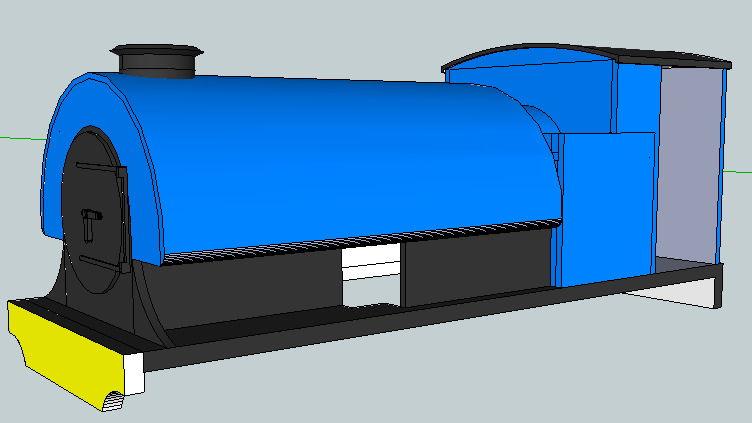 There's a lot to do here - the chimney will need reprofiling, the smokebox surround is missing, the wingplates are not quite the right shape, and of course there's the handrails and similar to take into account. The back sheet to the cab is being made as a separate item. This will allow us to make different variants for modellers to customize their basic bodyshell further, and it also allows modellers to get at the cab for painting and detailing purposes. Overall the project has given me greater insight into the trials and tribulations of model railway manufacturers: though admittedly on a much smaller scale, and done in one's spare time rather than as a business...yet. In these next few weeks, Sean is working on the next stage of the mesh's development, so hopefully we will have a little more to show and develop in the next update. Certainly we are looking to have some test builds finished around the middle of March. Of course, the first physical prototypes will show up some areas of improvement - once we've fixed those, we'll make a second wave of prototypes, and all being well, we'll look at putting the bodyshell into production. Of course, a saddletank is nothing without a train for it to pull...watch this space on that count.